If you’ve ever been to the movies in Japan, you’ve probably seen the anti-piracy commercial NO MORE 映画泥棒, or NO MORE Movie Thief. It’s pretty amusing, and always one of my favorite parts of the movie going experience. Ironically it’s also the only thing that’s ever made me even think of bringing a camera into a theater, and apparently plenty of other people have had the same idea. There’s lots of versions up on Youtube! I was looking for painting ideas the other day, and a friend requested this guy. He was pretty fun to paint. No More Eiga Dorobou is sufficiently popular that there’s even cosplay and fan art (some of which influenced this, for sure.) I guess this falls under that category! There’s even some rather adult material out there (this is the internet, after all) so be aware if you decide to go check it out. But in the meantime, please enjoy this little watercolor that I did. And if you have any requests, please let me know! 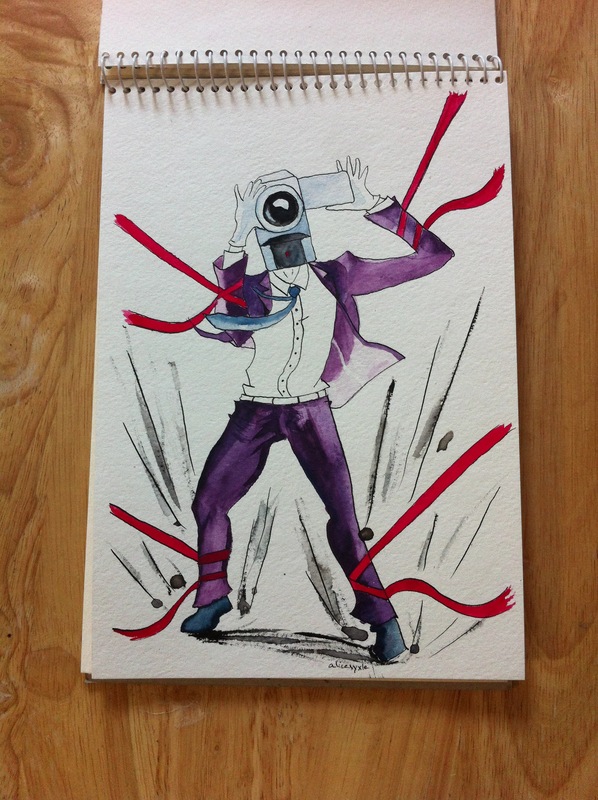 This entry was posted in Art, Video and tagged anti-piracy, Art, drawing, eiga, eiga dorobo, eiga dorobou, fan art, I made this, I painted this, Japan, Japanese, no more, no more eiga dorobo, no more eiga dorobou, painting, piracy, video, video camera, watercolor, watercolour. Bookmark the permalink. 5 Responses to NO MORE Eiga Dorobou! Video and watercolor! Hey there, I just returned to Los Angeles from my post as a JET. What happened in this painting? Is that red tape signifying the over-bureaucracy of Japan…or are they tentacles? Like the new purple suit by the way. Well superhappyawesome, it was a good job. Just saw this response, haha. Please sign and share the petition for “Spider-Man 4” at http://chn.ge/1hwxeEi We all love the eiga dorobou.